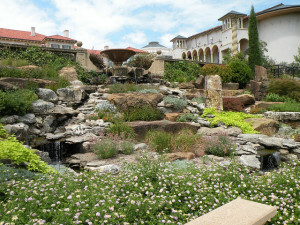 The use of high-end pavers and natural stone borders can add significant dramatic value to an otherwise ordinary path. Combined with the right flowers and shrubs, the effect can be truly stunning. The addition of a fire pit or a waterscape can add visual interest and a focal point to a side or backyard. With the right seating and other amenities, it can also adds a great place for entertaining your family and your friend. The nighttime also provides an excellent opportunity to show off the exterior of your home with spotlights and other specialty lighting. For more information on this topic or if you are already looking for landscape designers in the Atlanta area, please contact us online at OutdoorExpressions.net or reach us directly at 888-210-1116. Outdoor Expressions – Making your outdoor space a place to remember. Remain in Touch with Nature – While this may seem somewhat cliché, the idea of this sentiment is to include plants, shrubs and trees into your landscape and not just build a deck with a pool and some umbrellas. Create the Space – It may seem obvious but building a deck or patio that frames the entertainment space is the first step in developing the perfect outdoor experience for you, your family and your guests. Add Some Highlights – Whether it is an infinity pool or other water feature or a simple piece of art, these personalized touches are what will truly make the space your own. For more information on these and other ideas on hardscape construction in Atlanta, please contact us online at OutdoorExpressions.net or reach us directly at 888-210-1116. Outdoor Expressions – Making your outdoor space a place to remember. While concrete may not be the most aesthetically pleasing of surfaces, gravel and other stone surfaces do make very attractive water-conserving surfaces. 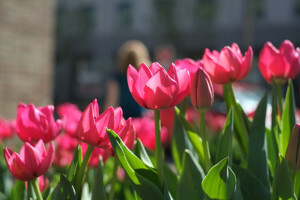 They are especially valuable in high-traffic places where a lawn would otherwise be useless. 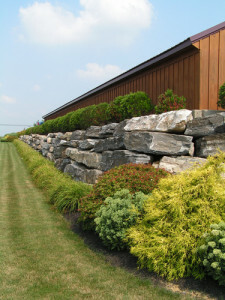 Adding plants to a wall create shade, reduce water consumption and create privacy – all benefits in a commercial space. Just don’t go too high or you might create a security problem. 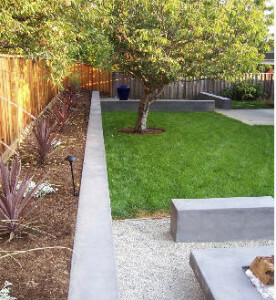 For more information on these and other commercial landscaping tips, please contact us at OutdoorExpressions.net or call directly to 888-210-1116. Outdoor Expressions – making your outdoor space a place to remember. Enhanced Privacy – Creating a fence using plants is a subtle but effective way to add some privacy to your backyard or entertainment space. They are also quite versatile as removing a few plants makes them seem a lot less intimidating. Added Air Purity and Fragrance – Planting shrubs and flowers above the ground adds oxygen to the environment and allows their perfumed air to travel more easily to you, your family and your guests. Increases the Health of the Yard – Many insects and birds avoid plants near the ground because of predators. Keeping a vertical garden gives these creatures a place of refuge and will enhance your yard both biologically and aesthetically. 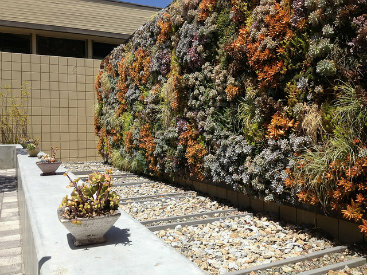 For more information on vertical gardens in particular and the benefits of commercial landscaping in general, please contact us online at OutdoorExpressions.net or call us directly at 888-210-1116. Outdoor Expressions – Making your outdoor space a place to remember. Variety is Essential – Don’t just consider the diverse plants, shrubs and trees that you can add to a garden but also try adding some color and texture change with rocks like slate and granite. Negative Space Counts – Leaving an open area with just a water feature or even a single bush is a great way to create a focal point in the garden. Man-Made Objects are Worthwhile – Sculpture and other artworks can add a real element of drama to an outside space as long as they are properly exhibited and protected from the excesses of Mother Nature. Stay Out of a Rut – Going with the same old design from last year may seem easiest but the fun of enjoying a new space for the next few months makes the extra effort worth it. For more information on these and other autumn gardening tips, visit us at OutdoorExpressions.net or call directly to 888-210-1116. Outdoor Expressions – Making your outdoor space a place to remember. Flower bulbs must be planted with care. 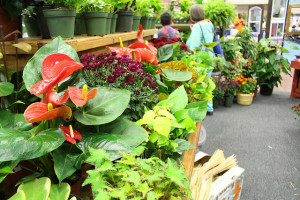 In particular, each specific plant has a different depth it should be planted as well as how far apart it should be spaced form its neighboring plant. The deeper you plant a bulb, the later in the season that it will ultimately bloom. Use this little trick to keep your garden flowering throughout the entire fall season. There is no use reinventing the wheel every year. For this reasons, you should include some perennials in your garden. They establish a nice base around which you can plant your annual bulbs. For more information on these and other autumn gardening tips, visit us online at OutdoorExpressions.net or call at 888-210-1116. Outdoor Expressions – Making your outdoor space a place to remember.